This scratch remover easily camouflages nicks, cuts, and dings in wood furniture. It’s made in Canada with a coconut oil-based formula that is VOC-free, which means it doesn’t contain any volatile organic compounds that can be potentially harmful to breathe. Dimensions: 1.87" x 1.87" x 6.75"
Used on a water stained cabinet with great success. 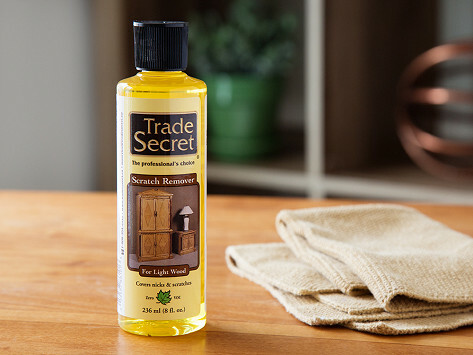 Trade Secret’s scratch remover has been, well, a trade secret for over sixty years. Now the solution long favored with moving companies and furniture refinishers is available to anyone who wants to spruce up their wooden furniture. The scratch remover camouflages nicks, cuts, and dings in wood while being more eco-friendly than similar products we’ve seen. The Wood Scratch Remover is made in Canada with a VOC-free coconut oil-based formula—that means it doesn’t contain any volatile organic compounds that can be potentially harmful to breathe. Now that the secret is out, it’s easy to give your furniture a quick-and-easy freshen up.